(Host) State environmental officials are continuing to float the idea of building a renewable energy project on the site of the abandoned asbestos mine in Eden and Lowell. Voters in the towns refused last month to declare the mine a Superfund site, which would have provided money to clean it up. (Carapezza) It’s been more than 20 years since the asbestos mine on Belvedere Mountain shut down. Since then, the Environmental Protection Agency has determined that asbestos fibers, if inhaled, could be hazardous, and that the mine’s waste could be polluting nearby water systems. Still, on Town Meeting Day voters in Eden and Lowell rejected the idea of designating the mine a Superfund hazardous waste site. 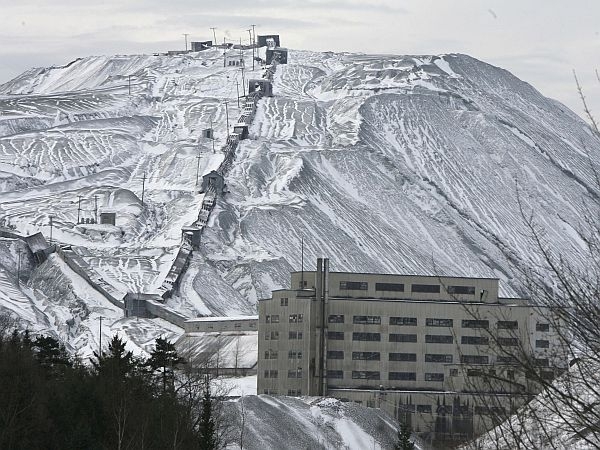 So, state environmental officials say they’ll no longer seek Superfund status for the asbestos mine, even though it could bring in much-needed funding to clean it up. John Schmeltzer is one of the state’s project managers for the site in Eden and Lowell. (Schmeltzer) "The towns voted and I was not surprised based on the community input that I received before that. And now we can try to figure out what our next steps are given that vote." (Carapezza) Schmeltzer’s office estimates that the total clean up of the mine could cost between $135 and $207 million. But Schmeltzer says, as the state addresses long-term erosion issues, it’ll have fewer tools without tapping into Superfund money. (Schmeltzer) "The resources are limited and it would be state funds. We’re going to have to go to the Legislature once we have a better handle what the costs are and request the funding." (Carapezza) But last year, months before Town Meeting Day, the state got a contract from the EPA to study the feasibility of a renewable energy project on the site once it’s finally cleaned up. Under the contract, only one type of energy can be considered. So, the state is now asking town officials in Lowell and Eden whether they would like to have a bio-mass plant or a solar project if there’s a developer willing to support one. Many voters, though, say the project has been mishandled from the start and they promise that there will be more local resistance to any plans for a renewable energy project. The federal and state government can’t afford to clean up an abandoned asbestos mine in northern Vermont now that voters have rejected a Superfund designation for the site. That’s the word from the state Agency of Natural Resources, and the EPA. VPR’s Jane Lindholm talks with Chuck Schwer of the Vermont Department of Environmental Conservation and Vermont Law Professor Martha Judy about Superfund sites and the cleanup process.